Each year hundreds of thousands of people attend the July 4th celebration at Boston’s Charles River Esplanade. There is a free concert featuring the Boston Pops Orchestra, as well as other major artists. 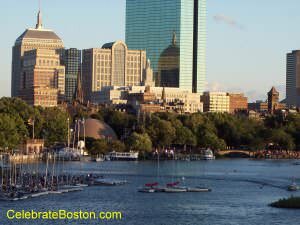 The Esplanade becomes saturated with a mass of people, and the Charles River Basin is filled with countless pleasure boats. The Pops concert is crowned with a huge fireworks display over the river in a grand finale. The Charles River Esplanade is a 2+ mile promenade and park located between Storrow Drive and the Charles. The land for the Esplanade was reclaimed by building upon former mud flats after the Charles River Dam was constructed in 1910. In 1908, the Riverbank Subway was proposed along the embankment, but logic prevailed and it was never built. A subway would have perpetually filled with water from the river, and its walls would have further prevented seepage of ground water into the landfill areas along Beacon and Charles Streets. A lower water table exposes and rots the wooden piles that hold up the old brick residences. The new river-way was originally called the Beacon Street Esplanade. The park quickly became a popular refuge for city residents. In 1940, the Hatch Memorial Shell was completed, and has been a popular venue for public concerts ever since that time. The Boston Pops Orchestra was established in 1885, presenting light classical music works from waltzes to populist marches. In 1929, Arthur Fiedler, a 35-year old Boston-born violinist, was named conductor of the orchestra. Fiedler had initiated the free open-air concerts at the Hatch Shell, which brought classical musical to the masses; a true public service. He retired in 1980, after more than 50 years in this position. The Fiedler Footbridge commemorates Arthur Fiedler’s life, as well as the beautiful sphinx-like Fiedler Statue located on the island opposite the shell. Traditionally, the grand finale of the Independence Day concert is a stirring rendition of Tchaichovsky's 1812 Overture by the Pops. A huge fireworks display lights up the entire Back Bay district, with hand-powered church bells ringing from ancient edifices in the nearby neighborhoods. During the fourth of July celebration, the Esplanade becomes extremely crowded. A wrist-band system was implemented for accessing the Hatch Shell lawn area, known as the Oval, to prevent overcrowding. The wrist-bands are usually distributed on the morning of the fourth, on a first-come, first-serve basis. The grounds just west of the Oval also fills to capacity long before dusk. After the Oval is full, pedestrians are diverted west down Beacon Street away from the Hatch Shell. If arriving late, visitors can still attain a nice view of the fireworks from Storrow Drive, Memorial Drive (Cambridge), or from the Longfellow Bridge located at Charles Circle. Many roads are closed to vehicular traffic during the event, which allows pedestrian views of the pyrotechnics from both sides of the river. Nearby high-rise hotels also present excellent views of the fireworks. Alternatively, chartering a boat on the Charles River is a popular method for enjoying the event.